The end of an era is near. In a new, five-minute Season 9 trailer, “The Walking Dead” teases Rick Grimes’ final episodes, and we’d be lying if we said it didn’t make us a little emotional. The trailer starts out with Rick (Andrew Lincoln) and Negan (Jeffrey Dean Morgan) having a chat, with Rick expanding on his “No matter what happens, it’s human nature to come together” line from the very first Season 9 trailer that was released at San Diego Comic-Con in July. Rick’s speech sounds an awful lot like his son Carl’s goodbye last season. “The Walking Dead” Season 9 premieres Sunday, October 7 on AMC. "The Walking Dead" Season 9 is still close to two months away, but we have some new photos from the first episode and we're obviously trying to glean as much information from them as possible. 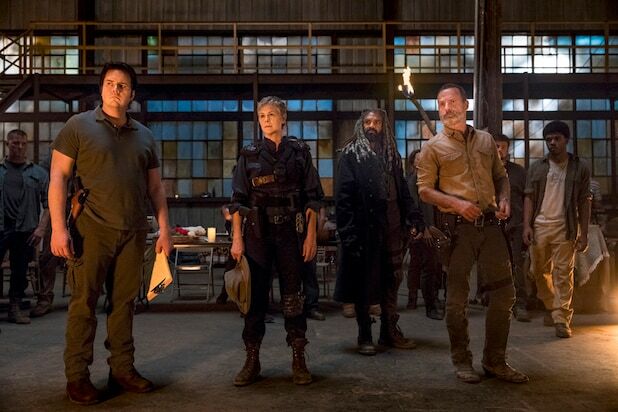 In this first photo, we see Rick (Andrew Lincoln), Carol (Melissa McBride), Ezekiel (Khary Peyton) and Eugene (Josh McDermitt). Michonne, looking fierce as always. In Season 9, Michonne has added a small plaid wrap from one of Carl (Chandler Riggs)'s shirts to keep his memory close, according to showrunner Angela Kang. Maggie (Lauren Cohan) has taken over as the leader of the Hilltop in the upcoming season, and it looks from this photo like she is indeed leading the pack. This photo looks like Maggie's Hilltop residents have encountered someone or something that's caught them by surprise. In the back, you can see former Savior Alden (Callan McAuliffe), who was once Maggie's prisoner. What are Daryl, Michonne and Rick looking at? Carol and Ezekiel are in a happy relationship at the beginning of Season 9. In one clip released from the Season 9 premiere, Carol tells Daryl that after having an abusive husband like Ed in the past, dating Ezekiel is nice -- even though he can be corny. We saw a bit of this scene in the Season 9 trailer released at Comic Con. It seems as though the crew has made it to Washington, D.C., and are trying to get this wagon out of a museum. Good ol' Jerry (Cooper Andrews) is here to hopefully provide some more of his sweet comic relief. Rosita (Christian Serratos) is writing something on this road sign. Remember the "A"s that will occasionally pop up? Showrunner Angela Kang recently said that "there is a meaning" to it, which we'll find out this season. Father Gabriel (Seth Gilliam) debuts a new glass eye after that strange condition that showed up last season. Daryl has his crossbow at the ready in this picture -- but we can expect the apocalypse's heartthrob to have some new weapons this season as well. Reedus helped design some "saw-backed Bowie knives with finger rings that allow you to quickly twirl the knives into different positions (you can grip them in either direction)," Kang said on AMC's blog this week. In this last shot, it seems like the crew were successful in getting that wagon and are headed... somewhere. Back to the Hilltop? To the communal camp from the trailer? Season 9 hits AMC on Sunday, Oct. 7.